Maybe you’re throwing around the idea of a jet ski and might be wondering what the pros and cons are? For a lot of people, a jet ski is something new and unique to them. Knowing whether or not it is going to be a good fit is very important to figure out beforehand. 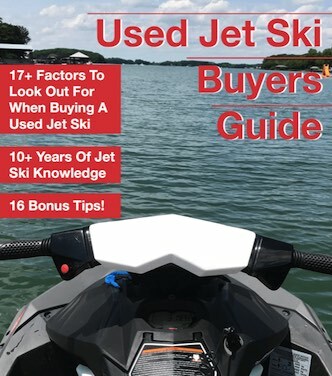 I want to go over all the GOOD and BAD that goes along with owning a jet ski so that you’re in the know before you buy. Nothing else like it and faster than you think – Driving 35mph in your car feels like nothing, but on a jet ski it feels like you’re flying. You don’t have a cabin around you like in your car, and the water around you gives you a feeling you can’t get anywhere else. Simpler and easier than a boat – Boats can be big and have a lot going on. A Jet Ski is smaller and often easier to maneuver than a boat. More control and safety features than a boat – Boats don’t have brakes, but most of the modern watercraft do. You also get more features like a learning mode and other things that make having a jet ski easier than having a boat. The motorcycle of the water – It’s like having a motorcycle, but it floats! And you don’t have the worries of a motorcycle like sliding on sand and holding yourself up. Some watercraft have stupid good fuel economy – Compared to some boats; you’re going to get great gas mileage. Check out the MPG for the Sea-Doo Spark. You can do tricks – You can flip, spin, and do many more tricks then a boat could ever do. Prices are good in the winter – Prices for used ones go down in the winter months. You can also get good deals on prior year models when they release new models. More Stable Than You Might Think – Some jet skis are more stable then you realize, like stand on the side of it stable. Servicing – To be honest, with the right tools servicing them is not hard. But it is having the right tools and knowing how to do it is the hurdle to overcome. Dealerships – Many jet ski dealerships are easy to deal with because they’re in the business of selling toys. So don’t expect to go in thinking of the horror of buying a car, it’s way different. Riding Clubs and Trips – There are many jet ski riding clubs and trips to join so you don’t get bored. Water Only Attractions – There are new fun things to try out like restaurants and attractions that are only located by water. Could even beach it and have a picnic for 2. If you can, buy two – It’s always more fun when you can go ride with someone else. Also, when in doubt buy a 3 seater as it sits 2 people better. 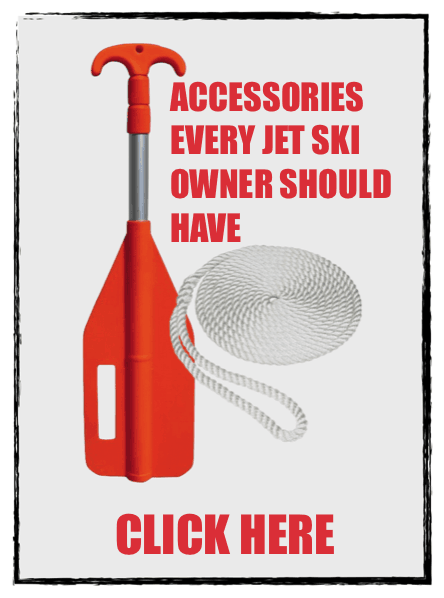 Easy to Clean – So much easier to clean than a boat and take out for a ride too. Smile More – It’s hard to frown on a jet ski. Trust me; you’ll be smiling the first time you take it out. Storage – Easier to store and cheaper too compared to a boat. Jet skis can fit in a garage or a shed you already have. Great for Couples – More personal, couples get to hold onto each other, unlike a boat. Everyday – A jet ski is something you can ride every day while the boat will more than likely become the weekend craft. Makes you feel alive – Gets the heart pumping no matter what speed you go. It makes you feel alive! Takes the stress away – Just you and the water rushing by, all the worries of life fade away. All the beautiful people – Let’s be honest, you get to see and be near a lot of beautiful people in swimsuits. Let’s dreams come true – for some people, you know you made it in life when you have a jet ski and jet skis like the Sea-Doo Spark or Yamaha EX are more affordable then you think. Nothing cooler than bragging to your friends that you have a jet ski! Cost more then you think – The average person thinks a jet ski is $5k, but in reality, the average price is over $10k. You can get the Sea-Doo Spark that starts under $6k in 2018. Service Cost – Maintenance and parts cost more for Powersports stuff. Doesn’t matter if its a boat, motorcycle, or jet ski they cost more than the equivalent of a car. Safety Gear is a Must – You need safety gear like life jackets before you drive. Wetsuit bottoms are recommended to, just read the warning sticker to learn more about this. Drivers license – There are rules and licenses for many states. For example, in my home state of North Carolina anyone born on or after Jan. 1, 1988 has to take a boaters safety course. Age – There are age limits, too young and you can’t drive. Check out your local wildlife or boating regulations for your state or country. No Roads – Since there are no roads you need to be more aware then when in your car. No Trailer, pay for pickups – If you don’t get a trailer expect to pay for pick up and drop-ins. Jet Skis don’t come with trailers – Here is a post going over that here. First Service – the First Service is not always included and its the most important service you can do so make sure to get it done. Insurance – While many places don’t require insurance, you’ll be a fool not to get it. Below Freezing – You have to winterize them if you live somewhere that gets below freezing. You don’t drive it as often as your car – Since you don’t drive it as often as your car you have to keep the battery on charge which is quite easy to do. If you don’t ride a jet ski for a month or two the battery can become weak. But if you ride more than once a month then you’ll be fine. This is more of an issue for long-term storage like you do in winter months. The Summer Makes Prices Go Up – They get more expensive during the summer, prices for used ones go up quite a bit (supply and demand). Extra service for a select few – Some models require more service than others, supercharged models require an additional service that amounts to every 8 to 10 years depending on how much you drive them, sometimes earlier than that if you drive it a lot. Can’t drive past sunset – And you can’t install lights to allow you to do it either. Some are not as stable as others – The REC-LITE models are super playful compared to the luxury models so be aware of this. And if you ask me, for average size adults, a 3 seater is really a 2 seater and a 2 seater is really a 1 seater. Buying the wrong machine could lead to headaches – I have a post that tells you what to avoid here.